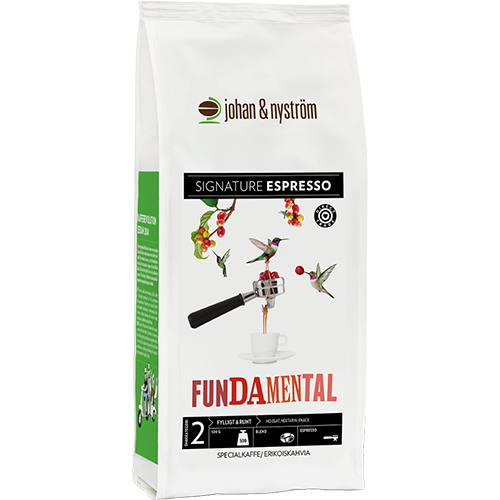 johan & nyström Fundamental coffee beans offers a crispy sweetness with a lovely bite of nectarine and a creamy, nougat-like feeling in the mouth. The blend is not revolutionary in itself, but it is very good. Very good in several ways. The blend, which changes every half year, is made from coffee from long-term collaborations that have benefited both the roaster and those who produce the coffee. As Johan and Nyström have grown, the producers have been able to do the same. Call it Direct Trade if you want, the roaster calls it a long-term hard work that started 2004 in Tullinge outside Stockholm and will continue for many years.